Rob specializes in cases involving personal injury, wrongful death, construction litigation, securities, medical malpractice, and insurance fraud. Rob has handled thousands of cases over the last 20 years and has collected tens of millions of dollars for his clients. Rob has been lead counsel in numerous cases that went to trial that resulted in multi-million dollar verdicts. He successfully litigated a case involving a plaintiff who was involved in an automobile collision and recovered a $15,000,000.00 award for her. Rob has served as counsel for the New York State Pension Retirement Fund, which was a co-lead plaintiff in the HealthSouth class action that resulted in settlements exceeding $800,000,000. Rob also represented Mobile County, Baldwin County and numerous municipalities in BP oil spill litigation. He has successfully represented individuals in mass torts, including patients who were injured during surgeries involving Intuitive Surgical’s da Vinci robot. 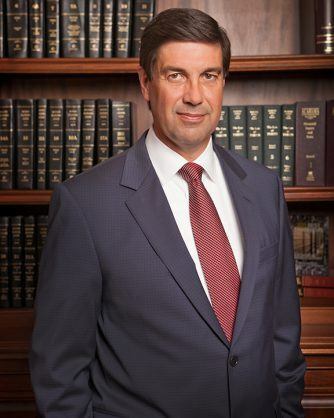 For several consecutive years, Rob has been selected as a Super Lawyer for the State of Alabama for litigation and has been named among the National Trial Lawyers Top 100 Trial Lawyers. Rob is also a member of the Million Dollar Advocates Forum. Rob is an AV rated attorney, reflecting the highest obtainable level of professional achievement and ethical integrity as voted on by his peers. In addition to practicing law, Rob has successfully managed his father’s political races for over a decade. After forming his own law firm in 1997, Rob managed his father’s successful congressional campaigns in 1998 and 2000. He later managed his father’s two successful gubernatorial campaigns as Bob Riley was elected as Alabama’s Governor in 2002 and 2006. Rob attended received his undergraduate degree from the University of Alabama, where he was selected as the top student in his class, receiving the Algernon Sydney Sullivan award. Rob graduated Phi Beta Kappa and also served as the Student Government Association President during his senior year at the University of Alabama. Rob then received his law degree from Yale Law School. He then attended the University of Cambridge (England) on a Rotary scholarship, where he received a Master of Law degree. Rob also previously served as a Professor for the Birmingham School of Law. Rob has been married to his wife Leslie for 25 years, and he has four children. Rob is active in various community affairs including King’s Home and Dawson Memorial Baptist Church. Rob was previously the Chairman of the Board of Directors of King’s Home, a non-profit that provides homes for abused and neglected children and women who are seeking refuge from domestic abuse. Rob has also taught a Sunday School class for over a decade at Dawson Baptist Church, where he previously served as a Deacon.